We thought the crookedest little Apple Store in Texas was an isolated case. We were wrong: confessions from Apple's retail squads around the country (and world) poured in. Apple has a serious naughty behavior problem on its hands, and the Evil Geniuses are speaking out. The sources we talked to this summer described an Apple Store that wasn't just poorly managed—it was a personal playground. Computers were traded for plastic surgery, iPhones were smashed like party favors, and employees outright stole from the back room for their own pleasure. It was a den of misuse and abuse, all under the gleaming white aegis of Apple Retail. The perfection is a myth. And now we know the store-gone-crazy is systemic, reaching from Tennessee to Vancouver, and across oceans. Here's what's happening in the stores you trust. The following sources contacted us via email and Skype, ranging from the Southeast, Tennessee, across California, Massachusetts, Canada, Maryland, Michigan, New York, New Jersey, and Texas. There were even more—"I worked in the most corrupt in the UK"—who couldn't be included in time. The habit of breaking things just because you can ran throughout our Genius Bar confessions. Because sometimes breaking expensive things is fun. For almost everyone who wrote in, the inventory room was a playground—and management was either oblivious or in on the action. Destroying expensive things for fun wasn't just a game—it was a documented game. Destructive Geniuses actually snap evidence of their handiwork. Here we see a shattered iPad, brand new in its box. The trick of swapping out broken, old, or otherwise unwanted employee gadgets for brand new ones out of store inventory was a regular one. Discount codes were also applied liberally where they didn't belong. In short: Geniuses played the system to get free toys. These two employees stole straight from the source—one even flipped Apple components and swapped in cheaper ones he bought online. 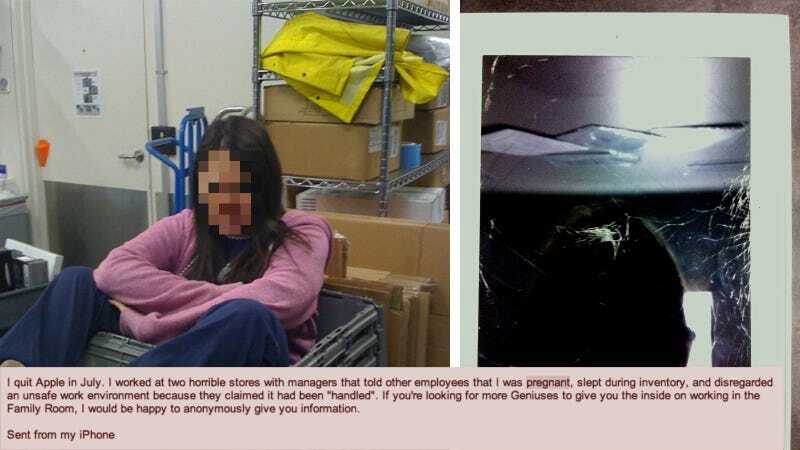 Our store source say managers and staffers harass each other regularly, with no consequences. Personal information—both staff and customer—is trivial. If a woman walked in, her stuff would get digged through, shared, and laughed at. Team bonding. Your iPhone camera roll isn't safe. Good looking customers were given whatever they want, says this source. Particularly—and with zero surprise—targeting attractive women. Bethesda is a tony suburb of Washington, DC—and a plum market for Apple. The store rakes in money, and caters to affluent, powerful business clients in the region. And according to our source, is as crooked as Scott Forstall's jacket tassels. He detailed a history of manipulation, deception, and borderline fraud. There are—and will always be—miscreants in every job. Miners, lawyers, cooks, Geniuses—there's no industry that's immune to misbehavior. But when emails arrived in droves repeating the same naughty phenomena, you have to wonder why a company whose rep is as sterling as Apple's seems to have such a pattern of internal havoc. Employees lamented how the company's "culture has declined significantly," that the former "culture is definitely not there anymore." One former employee who had opened retail stores across North America and Asia claimed "The corruption within Apple goes straight to the top. That is why I left, I couldnt tolerate it anymore. Under Mr. Cook, Apple is fracturing from the inside out." But there's probably a less theatrical explanation here. Apple Stores mint their own gold. They sell some of the most desirable expensive products in the history of desirable expensive products, without the pressure of commission. The stuff sells itself—and websites like ours sure help—and that's why Apple has the most profitable retail operation per square foot in the entire country. The stores make more money than Tiffany, which literally sells giant diamonds. So why care? When you're in a fog of money, you can imagine it's easier to lose sight of scruples. This doesn't make stolen phones and smashed computers OK, but it might explain why its's so pervasive. And until Apple realizes that its own massive consumer success might actually be a liability, turning its sales mills into playgrounds, we're going to have ever reason to hesitate before handing over our MacBook to that smiling Genius. Do you have more to share from your time at Apple? Email me.